The Reeducation Centre in Buzias is so nice that it gave me the chills when I first saw it. I say it because, if I were a minor, coming from a poor family, with an alcoholic and abusive father, once arrived in here, I would never want to go back home. Yet, dramatically enough, at least 80% of the children brought here, at Gaiesti and Targul Ocna, are ending up in prisons as adults. I’ve met in Buzias plenty of children, each of them carrying a devastating story behind. I would like to come back some day and give a voice to these stories as well. This time I will only focus on the story of Laurentiu. Tall, dark-haired, with an innocently sweet face, you won’t even imagine if you saw him round the corner that by the age of 12-13 years old, he managed to count dozens of stealing, out of cars, apartments, or stores. Born in Petrosani, the kid aged 17 was in the Centre for approximately one year and a half, when I first met him. That was not what made him special, but his mother, working in Italy, in an attempt to offer her son a better life. Lori gave birth to Laurentiu at only 16. Her first marriage didn’t last more than one year and ended up as a relief, coming from numerous painful abuses. After one year, Lori met Marius and they are together since. Marius was like a father for Laurentiu. It was never easy, but they managed to carry on. That was until 2004, when Lori left Romania to work in Italy. Laurentiu was just 11 years old then. When she got back in 2006, she found out for the first time about Laurentiu’s deeds, but something inside of her didn’t want to believe what she just heard. His criminal record begins at 12 years old, when he was accused of stealing a wheel out of a car. In 2007, Lori needed to depart again. Once arrived in Aostei Valley, with a little bit of luck found a job as a waitress in the small Victory Pub restaurant. She worked hard but she was content that by the end of the month she could sent money and packages back home. Laurentiu didn’t need to worry about anything while she worked in Italy. He had clothes and money, and even a scooters park, he was in charge to rent. Money were not an issue when the boy started to steal. In 2009 an unexpected event occurred. The death of his aunt put an enormous pressure on his family, they were practically obliged to sell everything they had, Laurentiu’s clothes inclusively, to bear the expenses of the funeral. This sad event, its consequences, and the association with a group of kids which committed felonies regularly set Laurentiu on a path that will lead him to a almost two years sentence. The news of his arrest found her in Italy and stroke her like a lightning. She would have wanted to help him but she didn’t know how. And it was not much to be done. She hasn’t seen him since the moment he was arrested. Normally, Laurentiu should have been released when he was 18. For good conduct, he was proposed to be released before term. On 8 August he got out with this father through the gate of the Reeducation Centre in Buzias. Nowadays, over 4 million Romanians, in despair about the conditions back home, decided to leave and work abroad. Most of them leave their kids with their grandparents or aunts and uncles. Unfortunately, some children left in these conditions commit suicide because they miss their parents. Other children, stronger, are alive but struggling. I asked Lori what she could have done differently if she could. With tears in her eyes she told me: „I would not leave his side again. I wanted to give him everything but I only got him into troubles”. Laurentiu is a lucky child still. His adoptive father came to take him in Italy too. A couple of days after, Laurentiu managed to get employed in the same restaurant in which his mother works. Work, vigilance and distance from bad entourage could offer Laurentiu a second chance. But how many children like him have this second chance? Matei Daniel (watching guard on duty) Laurentiu giving a haircut to one of his inmates (Hampu Alin) as seen inside the Youth Reeducation Centre in Buzias, August 6, 2011. As an on growing social phenomenon, many romanian kids commit suicide or end up in youth reeducation centres as a result of being left unattended by parents working abroad, in search of a better life. Laurentiu served a sentence of almost 2 years and he was released before term on good behaviour. 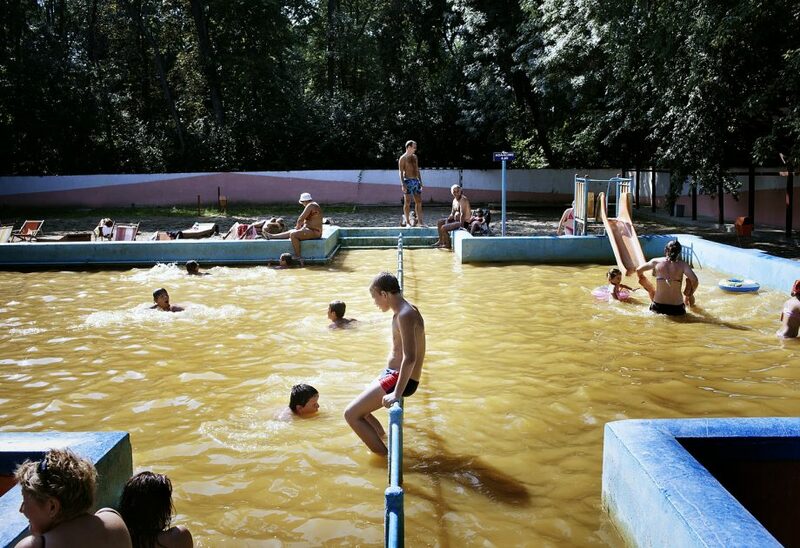 Civilians seen enjoying the mineral water swimming pool in Buzias, after the kids from the YRC cleaned early same year. The swimming pool was cleaned prior season with the help of the inmates from the Youth Reeducation Center. As an on growing social phenomenon, many romanian kids commit suicide or end up in youth reeducation centres as a result of being left unattended by parents working abroad, in search of a better life. Laurentiu served a sentence of almost 2 years and he was released before term on good behaviour. Laurentiu, Gruia, Retmuves Dorel, Mihu Alexandru, Bogany Sergiu, Domsa Gabor and Ozarchevici Ciprian, seen watching Gaspar Norbert dance, between classes, inside the Youth Reeducation Centre in Buzias, June 10, 2011. As an on growing social phenomenon, many romanian kids commit suicide or end up in youth reeducation centres as a result of being left unattended by parents working abroad, in search of a better life. Laurentiu served a sentence of almost 2 years and he was released before term on good behaviour.